#9 of Our Top Stories of 2016: Feathers on a Bird or Dinosaur Tail? 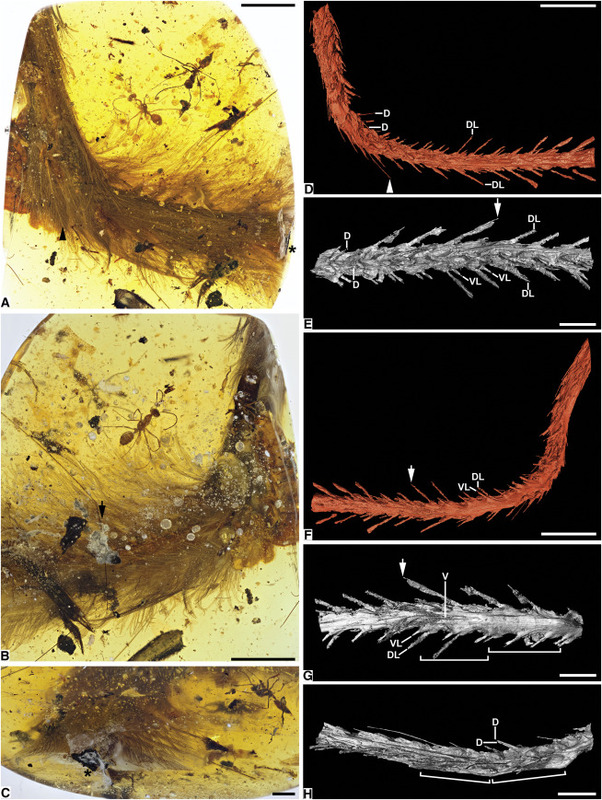 The semitranslucent mid-Cretaceous amber sample, roughly the size and shape of a dried apricot, captures one of the earliest moments of differentiation between the feathers of birds of flight and the feathers of dinosaurs. The reason that they claim it is a dinosaur and not a bird is because this is supposedly from a “long-tailed” individual. Most birds with bony tails are short-tailed, meaning they have fewer vertebrae in their tail compared to dinosaurs. Under ten vertebrae, perhaps only six or seven, would be the norm for a bony-tailed bird. So what do they think about the number of vertebrae in this amber fossil? They say the living individual “likely” had more than 25 vertebrae. SR X-ray μCT scanning of DIP-V-15103 revealed that soft tissues have a density insufficiently different from the partially replaced skeletal elements to permit X-ray imaging and virtual dissection of osteology alone. Consequently, many diagnostic and comparative osteological details remain obscured. However, two vertebrae are clearly delineated ventrally (Figures 1F-1H). Extrapolating lengths of these vertebrae, the preserved tail section contains at least eight full vertebrae and part of a ninth. Archaeopteryx retained an ancestral caudal vertebral count of between 20 and 23. The next most basal bird, Jeholornis, from the Jiufotang Formation of China and dated at approximately 120 million years old, was also long-tailed, and had 22 caudal vertebrae that are nearly identical to those of Archaeopteryx. If it did have up to 20 to 23 vertebrae, it could still be a bird. Yet again it’s not clear exactly how many vertebrae this tail had because too much of it is missing. Even with the skin adpressed to the bony surface, no features other than the grooved ventral sulci of two centra are clearly visible. This lack of topography suggests that the vertebrae lack prominent neural arches, transverse processes, or hemal arches. Therefore, the preserved segment is only a small mid to distal portion of what was likely a relatively long tail, with the total caudal vertebral count not reasonably less than 15, and likely greater than 25. So they claim that the shape of the vertebrae suggests that what they are seeing is from the middle of the tail, and the actual tail was much longer. They admit that most features are not “clearly visible.” Given that you can barely distinguish soft tissue from bone in this fossil, their inferences go too far. [T]here is a distinctive ventral groove on the caudal centra of the specimen, which is widely distributed among non-avialan theropods but which has yet to be reported in avialans (though the possibility of its presence in the two known long-tailed birds Archaeopteryx and Jeholornis cannot be excluded). As a final note, one could argue that the age of the fossil (about 99 Ma) suggests that this individual lived long after known long-tailed bony-tailed birds. According to this paper, the most recent long-tailed bony-tailed bird lived about 122 million years ago. That would be a very weak argument, however, since evolutionists regularly tolerate chronological gaps in the fossil record much greater than 20 million years. In fact they do this in their dinosaur-to-bird hypothesis. After all, the dinosaurs that they claim supposedly gave rise to birds lived about 125 million years ago, but true birds like Archaeopteryx lived as far as about 150 million years ago. That’s a major time gap. So if one were to propose that perhaps the long-tailed birds known from ~122 million years ago survived until ~99 million years ago, you would not be extrapolating fossil lineages any more than they already do. In any case, all praise is due to the researchers for discovering and presenting this beautiful fossil with its unmistakable feathers. Probably no known feathers this old have ever been preserved in such gorgeous detail. But unfortunately we have so little material, and the bone is so difficult to distinguish from the soft tissue, that any strong claims about this tail should be greeted with skepticism. This paper will not be the last word on the nature of the animal that sported this wonderful tail. Photo credit: Ryan McKellar/Royal Saskatchewan Museum via Science Daily.